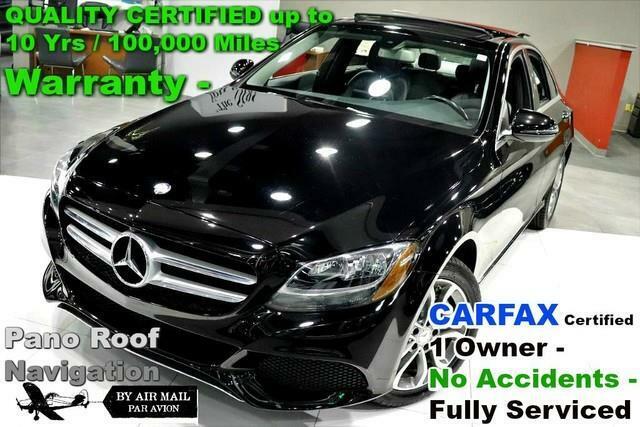 Quality Auto Center is honored to present a wonderful example of pure vehicle design... this 2016 Mercedes-Benz C-Class C 300 Sport 4MATIC - CARFAX Certified 1 Owner - No Accidents - Fully Serviced - QUALITY CERTIFIED up to 10 Yrs / 100,000 Miles Warranty - only has 39,984mi on it and could potentially be the vehicle of your dreams! This Mercedes-Benz includes: SD-CARD FOR GARMIN MAP PILOT NAVIGATION BLACK PANORAMA SUNROOF PREMIUM 1 PACKAGE *Note - For third party subscriptions or services, please contact the dealer for more information. * Why own a car when you can own a lifestyle? We at Quality Auto Center offer you nothing less than the best with our Certified Pre-Owned vehicles. This vehicle meets Mercedes-Benz's highest level of standards, allowing us to provide you with what you deserve. You appreciate the finer things in life, the vehicle you drive should not be the exception. Style, performance, sophistication is in a class of its own with this stunning Mercedes-Benz C-Class. This 2016 Mercedes-Benz C-Class has great acceleration and wonderful styling without sacrificing exceptional fuel economy. Comfort. Performance. Safety. Enjoy all three with this well-appointed AWD 2016 Mercedes-Benz. In addition to being well-cared for, this Mercedes-Benz C-Class has very low mileage making it a rare find. More information about the 2016 Mercedes-Benz C-Class: The C-Class has traditionally been Mercedes-Benz' entry-level car. However, with the arrival of the CLA, the C-Class is no longer the German automaker's least expensive model. Mercedes-Benz has packed the 2016 C-Class full of upscale technology, determined to make the car feel anything but entry level. Despite this move upmarket, pricing on the C-Class remains competitive with other European small sedans such as the BMW 3-series. The 2016 C-Class starts at around $40,000. Interesting features of this model are high-end features, all-wheel drive, Attractive modern styling, fuel-efficient diesel and hybrid engines, plus powerful turbocharged engines, and typical Mercedes-Benz luxury No Credit / Bad Credit / No Paystubs, No problem !! ! All Approved ! Everyone drives ! CLEAN, GORGEOUS, LOW MILES, SHOWROOM CONDITION. CALL NOW QUALITY CERTIFIED up to 10 YEARS 100,000 MILE WARRANTY , To Certify a vehicle, there will be an additional cost for Certification. CALL NOW For details. STUNNING AGGRESSIVE LOOK ON THIS BEAUTIFUL--Call today to schedule a test drive... Good Credit/Bad Credit/No problem!!!! Get paid cash? No problem!! 100% Credit Approval with interest rates starting at 2.49% for qualified customers, our rates will not be beaten. We price our cars at wholesale price to guarantee the best deals for our customers. Our inventory moves quick, please call to confirm the availability of the vehicle of your interest Springfield location 973-564-0112. This vehicle is located at our SPRINGFIELD location. Come visit our new showroom in Springfield NJ.